Located on a narrow isle in the Gulf of Finland, the city of Kronstadt has been watching over the approaches to St. Petersburg since its founding in 1703. Kronstadt is a city located on Kotlin Island in the Gulf of Finland. In 1703, on the southern part of the island, Peter the Great ordered the construction of a fort to protect the approaches to St. Petersburg from the Swedish navy. The foundations of the fort were built during the winter, and used ingenious techniques. They built small wooden cabins right on top of the ice that covered the bay, and then filled them with heavy boulders. Under their own weight, these constructions sank to the bottom. Thus was laid the foundation of the first building of the Kronstadt, the Kronshlot Fort. This fortress was completed by May 1704. The Swedes, sailing by at the opening of the navigation season, were more than a little surprised to see this new island, which seemed to have appeared from nowhere. After Kronshlot, the city was actively built up and developed. Peter at one time even considered moving the capital of Russia to Kotlin Island, proof of the sovereign’s great affinity with water. This utopian idea failed, but many of the fantasies of this baroque autocrat still managed to become implemented. Kronstadt, in many respects is similar to St. Petersburg; here we find the same rigorous grid of streets, also being dominated by classic buildings. Nevertheless, many things in this city are found only in Kronstadt. Kronstadt is strikingly different from other suburbs of St. Petersburg. Peterhof, Pushkin, Pavlovsk, and Gatchina were built as places of recreation and entertainment for the royal family. Kronstadt, on the contrary, was built “for serious business”. For a long time, the city was the main military base of the Baltic Fleet, and sailors and their families still make up a significant part of the population of Kronstadt. Warships continue to moor at the city’s wharves, and the city is still dominated by the spirit of a military camp. A trip to Kronstadt is a perfect getaway for those who have had their fill of Petersburg’s most celebrated landmarks. The fresh sea air, unpretentious architecture and romantic forts are a world away from the brightness of the Peterhof fountains, the colorful mosaics of the Church of the Savior on Blood and the shine of the brand new Amber Room. When strolling in the city, it makes sense to divide the city into two parts. The first walk will be devoted directly to the city, while the second will include its surroundings and visits to the city’s sea forts. 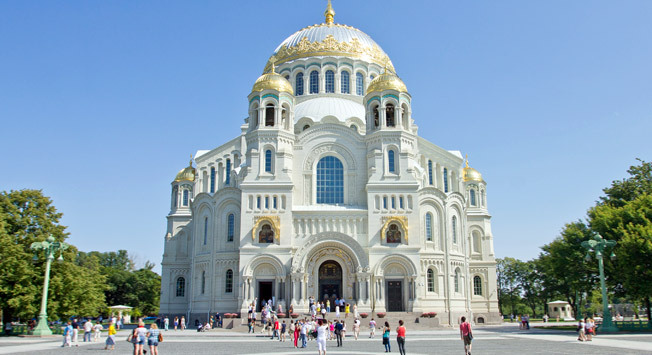 The best place to start exploring the city is the Kronstadt Naval Cathedral. The golden dome of this temple can be seen from almost anywhere in Kronstadt, while it is comparable with Istanbul’s Hagia Sophia in size. Finding it is not difficult at all. At the anchorage area, in addition to the Naval Cathedral, a piece of a cast iron bridge has been preserved. Instead of cobblestones, the square is paved with metal bars – this technological chic of mid-19th century can be found only in Kronstadt. Via this bridge, you can walk out to the bypass canal. This canal envelops the vast territory of the Admiralty, a complex of buildings and engineering structures mostly built in the 18th century. Located along the canal is the extensive Catherine Park. The canal empties into a small harbor, which inexplicably is called the Italian Pond. Designed according to Peter’s ideas, the harbor was a convenient place for the mooring of merchant ships. The impressive building opposite the harbor is the Italian Palace, built by one of Peter the Great’s associates, Alexander Menshikov. While the former splendor of the palace has not been preserved - the building has caught fire several times and kept changing its functions - the palace now serves as a residence for military officers. By the Italian Pond, at the tip of the pier, stands a lighthouse with remarkable architecture. From afar, the lighthouse looks like a white obelisk built of white stone. Upon closer inspection, it turns out that the lighthouse is clad in wooden panels, which in no way spoil its appearance. Continue your stroll in Petrovsky Park, which is located a little lower down the coast. On the way to the park, you should pay attention to the dock bridge over the Peter the Great Canal. It is worthwhile to stop at this bridge, because it overlooks one of the main attractions of Kronstadt – the Petrovsky Dock. This dock, needed to carry out repairs to ships, was built during Peter’s reign, with the active participation of the sovereign himself. The ship enters the dock, after which the water, through a system of locks, is lowered into a special pool. This lock system is especially remarkable – with its help, the dock can be completely drained in just a few hours, something that has made indelible impressions on visiting foreigners. Pumping out of the water in similar Western docks took weeks to achieve. Surprisingly, even in the 1980’s seamen used this dock for its intended purpose. It was used to make repairs to small warships. Now it lies in neglect, just like the entire territory of the Admiralty. Once finally in the park, one must go and see the monument to Peter the Great, by the sculptor Jacques Theodore-Napoleon, made on the orders of Nicholas I and installed in 1841. From this monument, you can move on to the granite Petrovsky Pier, opened in 1882. Lunch. The gastronomy of Kronstadt is not too refined, and this indicates that the city is still living for the needs of the local population. The city’s main eating spots are concentrated in the center, within walking distance of the Naval Cathedral. For Chinese food, the Zolotoi Lev at 45 Prospekt Lenina serves pig ears, roasted pineapple and chicken heart soup. The average check is 1,000 rubles ($28). A little further, at 57 Prospekt Lenina, is the Mario Restaurant, offering a hodgepodge of Italian and Japanese cuisine. The interior is brightened by vaulted ceilings. Expect to pay from 500–1,500 rubles (10–31 euros, 14–42 dollars). If you see food not as an urgent need, but as an adventure, it’s worth visiting the Austeriya at 43 Sovietskaya Street. This Kronstadt mainstay combines a noble interior with crazy neon lights and plastic plants. This is an authentic place where locals come to relax. The menu has the standard central Russian selection – pelmeni, solyanka, borscht. Though the clientele is a little wild, they nevertheless prepare the meals well here. The check here will come to 500-1500 rubles ($ 14–42). For the first part of the afternoon’s exploring, take a taxi to the Schantz Fort at the western tip of the island. The fort was built in 1706 and later rebuilt and reorganized several times. In 1930, the military guns were removed and a command post was placed in the fort. Now the fort is empty, and the residents of Kronstadt come to its grassy ramparts to have picnics and barbeque shashlyk. After passing through the Schantz Fort, you find yourself on a marshy strip of land stretching several kilometers towards the Gulf of Finland. In 2012, this part of the island was turned into a nature reserve. Environmentalists were attracted by the alder forests, nesting sites and stopovers of numerous birds migrating along the White Sea-Baltic Sea route. The island is crossed by the northern Kronstadt Road leading to the Rif Fort. The road makes for a long walk over the marshes and swamps. Alternatively, take a ride out to sea. Right from the Petrovsky Pier, tour boats offer sightseeing trips on the Gulf of Finland. Such trips are relatively inexpensive – about 400 rubles ($11) per person. If possible, it is best to come to the pier at 3:30 p.m. or 5:30 p.m., as at this time the ship Reeperbahn departs from the pier. The ship was built in the 1950s in Hamburg and was named in honor of the city’s famous red light district. Standard itinerary includes the Kronshlot Fort, the Peter I Fort, the Alexander 1 Fort, the Milutin Fort, and the final land fortress, the Konstantin Fort. You can land at the Alexander I Fort, while all the other fortresses can be viewed only from the water. The Alexander I Fort is perhaps the most famous fortress in the waters of the Gulf of Finland. The black granite cylindrical edifice completely occupies a small artificial island. Built in the mid-19th century, for fifty years the fort served as a military facility, then later housed a plague laboratory. In the 2000s a rave party called Fort Dance was held annually at the Alexander I Fort, and was one of St. Petersburg’s most eagerly awaited club events.